DIE Martis, videlicet, 19 die Aprilis. Moore to be released out of Newgate, upon giving Bail not to go to Ireland during the Rebellion. Committee for the Kentish Petition to examine Witnesses about Words of Sir Geo. Stroude. L. Montague to send Horses to France, for his own Use. Order for 6000l. for Munster, from Ireland Adventurers. Message from the H. C. for Expedition to the Propositions for a Sea Adventure to Ireland. E. Bristol and Justice Mallet about the Kentish Petition. Archbishop of York Leave to take the Air. Committee to consider of the Propositions for a Sea Adventure to Ireland. Busby and Smith in Error. Message to the H. C. with Bills. 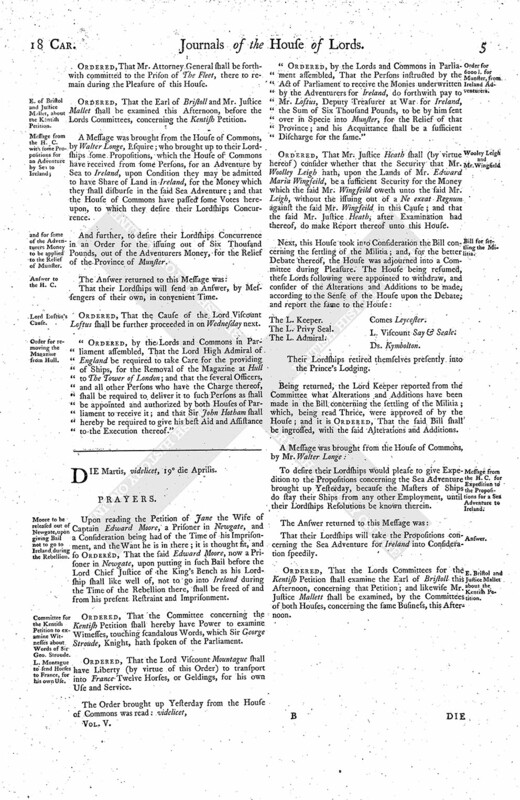 Report of the E. of Bristoll's and Justice Mallet's Examination about the Kentish Petition. E. Bristol released upon his Petition. Conference to be had, about a Declaration against those who shall procure Petitions against the Militia. Lord St. John versus Benyon. Upon reading the Petition of Jane the Wife of Captain Edward Moore, a Prisoner in Newgate, and a Consideration being had of the Time of his Imprisonment, and the Want he is in there; it is thought fit, and so Ordered, That the said Edward Moore, now a Prisoner in Newgate, upon putting in such Bail before the Lord Chief Justice of the King's Bench as his Lordship shall like well of, not to go into Ireland during the Time of the Rebellion there, shall be freed of and from his present Restraint and Imprisonment. Ordered, That the Committee concerning the Kentish Petition shall hereby have Power to examine Witnesses, touching scandalous Words, which Sir George Stroude, Knight, hath spoken of the Parliament. Ordered, That the Lord Viscount Mountague shall have Liberty (by virtue of this Order) to transport into France Twelve Horses, or Geldings, for his own Use and Service. "Ordered, by the Lords and Commons in Parliament assembled, That the Persons instructed by the Act of Parliament to receive the Monies underwritten by the Adventurers for Ireland, do forthwith pay to Mr. Loftus, Deputy Treasurer at War for Ireland, the Sum of Six Thousand Pounds, to be by him sent over in Specie into Munster, for the Relief of that Province; and his Acquittance shall be a sufficient Discharge for the same." Ordered, That Mr. Justice Heath shall (by virtue hereof) consider whether that the Security that Mr. Woolley Leigh hath, upon the Lands of Mr. Edward Maria Wingfeild, be a sufficient Security for the Money which the said Mr. Wingfeild oweth unto the said Mr. Leigh, without the issuing out of a Ne exeat Regnum against the said Mr. Wingfeild in this Cause; and that the said Mr. Justice Heath, after Examination had thereof, do make Report thereof unto this House. The L. Admiral. Comes Leycester. Their Lordships retired themselves presently into the Prince's Lodging. Being returned, the Lord Keeper reported from the Committee what Alterations and Additions have been made in the Bill concerning the settling of the Militia; which, being read Thrice, were approved of by the House; and it is Ordered, That the said Bill shall be ingrossed, with the said Alterations and Additions. To desire their Lordships would please to give Expedition to the Propositions concerning the Sea Adventure brought up Yesterday, because the Masters of Ships do stay their Ships from any other Employment, until their Lordships Resolutions be known therein. That their Lordships will take the Propositions concerning the Sea Adventure for Ireland into Consideration speedily. Ordered, That the Lords Committees for the Kentish Petition shall examine the Earl of Bristoll this Afternoon, concerning that Petition; and likewise Mr. Justice Mallett shall be examined, by the Committees of both Houses, concerning the same Business, this Afternoon. Upon reading the humble Petition of John Archbishop of Yorke, a Prisoner in The Tower of London; it is Ordered, That he shall have Liberty (by virtue of this Order) to go abroad with his Keeper, to take the Air, for his Health, provided he return every Night to his Lodging in the The Tower. Comes Portland. L. Viscount Say & Seale. Their Lordships, or any Five, to meet when and where they please. Ordered, That the Writ of Error between Busby and Smith shall be argued on Thursday come Sevennight, at this Bar, by Counsel on both Sides. Ordered, That Mr. James Jackson, Doctor of Physick, shall be examined upon Oath, by Sir Robert Rich, One of the Masters of the Chancery, on the Behalf of the Lady Hastings; and that Mr. Poulton may cross-examine, if he think fit; and the Depositions to be made Use of at the Hearing of the Cause. Hodie 3a vice lecta est Billa, An Act for the ordering of the Militia of the Kingdom of England and Dominion of Wales. Memorandum, The Earl of Portland, before the putting of this Question, desired Leave of the House to enter his Dissent to this Question; which was granted. 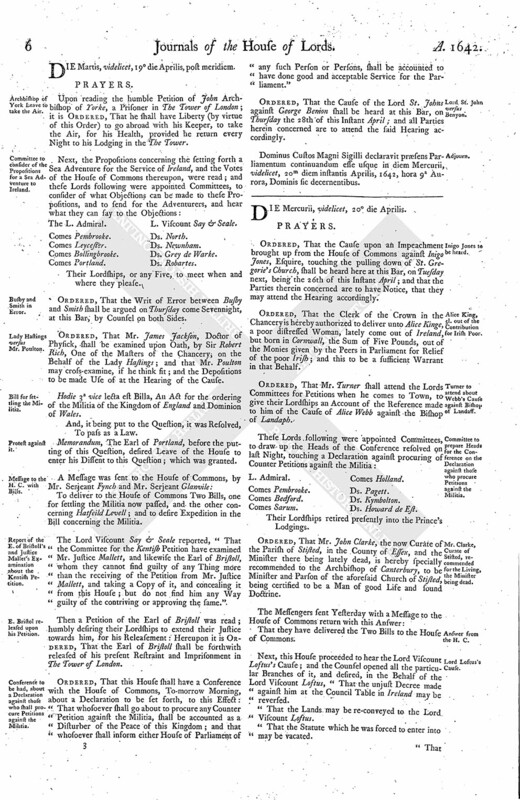 To deliver to the House of Commons Two Bills, one for settling the Militia now passed, and the other concerning Hatfeild Levell; and to desire Expedition in the Bill concerning the Militia. The Lord Viscount Say & Seale reported, "That the Committee for the Kentish Petition have examined Mr. Justice Mallett, and likewise the Earl of Bristoll, whom they cannot find guilty of any Thing more than the receiving of the Petition from Mr. Justice Mallett, and taking a Copy of it, and concealing it from this House; but do not find him any Way guilty of the contriving or approving the same." Then a Petition of the Earl of Bristoll was read; humbly desiring their Lordships to extend their Justice towards him, for his Releasement: Hereupon it is Ordered, That the Earl of Bristoll shall be forthwith released of his present Restraint and Imprisonment in The Tower of London. Ordered, That this House shall have a Conference with the House of Commons, To-morrow Morning, about a Declaration to be set forth, to this Effect: "That whosoever shall go about to procure any Counter Petition against the Militia, shall be accounted as a Disturber of the Peace of this Kingdom; and that whosoever shall inform either House of Parliament of any such Person or Persons, shall be accounted to have done good and acceptable Service for the Parliament." Ordered, That the Cause of the Lord St. Johns against George Benion shall be heard at this Bar, on Thursday the 28th of this Instant April; and all Parties herein concerned are to attend the said Hearing accordingly. Dominus Custos Magni Sigilli declaravit præsens Parliamentum continuandum esse usque in diem Mercurii, videlicet, 20m diem instantis Aprilis, 1642, hora 9a Aurora, Dominis sic decernentibus.